As books, manuscripts, and papers continue to be treasured and tended, the multiform products of a digital age are being gathered, cataloged, and stored. .A new Web portal for the revamped Harvard Library is opening the window on a massive reorganization effort that is designed to preserve the incredibly valuable print past while embracing the increasingly important digital future. Even as books, manuscripts, and papers continue to be treasured and tended, the multiform products of a digital age, including massive gigabytes of stored data generated by scholars, are being gathered, cataloged, and stored. Packaging up digital content was one mission of the library’s transition into a cooperative organization, the first time that all of Harvard’s libraries have been brought under one operational roof. After nearly four centuries, the speedy expansion of the digital age prompted a single library mission and an integrated structure. The most dramatic and visible outward sign of the reorganization is the new online library portal, which went live Sept. 18. Users can search multiple catalogs, can quickly search library hours, Schools, and amenities, and can review library-related events and articles. There is also access to a library-wide staff directory. One month later, the eight-member Library Implementation Working Group was formed to put the recommendations in place. By August 2011, after 18 months of groundwork, the design phase began. The 31-month transition gave Harvard “the gift of time,” Kennedy said, time enough to do a thoughtful, thorough job. But it was not easy. “My metaphor was three-dimensional chess,” said Shenton, who came to Harvard in 2010 from the British Library. “We did a lot of analysis. It was very comprehensive.” The reorganization required assessing systemwide needs, examining functions across the dozens of libraries, and creating a system of shared services for access, preservation, conservation, digital imaging, and information and technical services. s own in-house experts, and enlisted others from the Rochester Institute of Technology, the New York Public Library, and Cornell and Stanford universities. New hires came next, most of them from within. Over the summer, more than 400 library staff members were notified of new roles and supervisors. 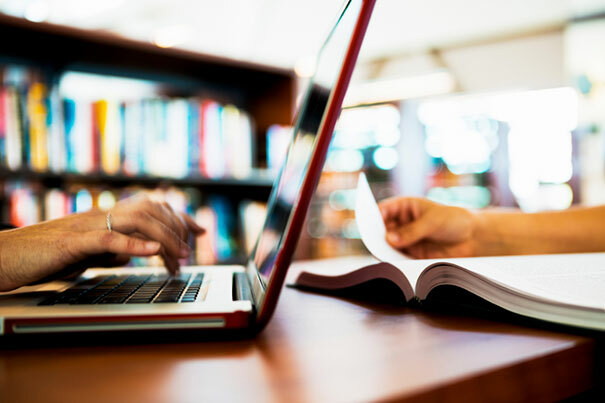 With the new online library portal, users can search multiple catalogs, can quickly search library hours, Schools, and amenities, and can review library-related events and articles. It was important that all of the libraries retain their unique identities and relationships with researchers. Still, the Aug. 1 changeover required finding a way to make the many libraries thematically coherent. So the transition included creating five “affinity groups,” charged with working across all libraries. Their primary task is to focus in content development. Their overarching question is: What should Harvard collect and provide access to in order to support the mission of research, teaching, and learning? The machinery of the transition went on behind the scenes, but library users already can find some benefits. Faculty and students have more ways to get information from other sources. They also now have access to more than 30 million additional items through Borrow Direct and 10.5 million online volumes through the HathiTrust Digital Library. Later this month, Harvard Library will launch data management training for scholars using the Dataverse Network. Researchers can deposit their own data in a stable platform, and they can access data from other sources worldwide. In addition to the new library portal, Tell Us, an online student feedback tool for library services, also formally launched this fall. There is more is to come. The library’s Innovation Initiative issued a report recommending future actions. A “technology tiger team” will start work on two large-scale pilot information technology projects. One is the Harvard Library Innovation Lab’s LibraryCloud 2.0/OA Metadata (open-access metadata). 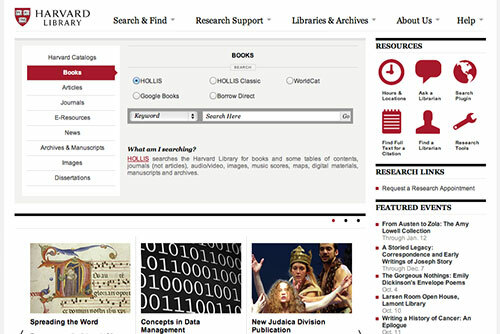 The other is a programming interface for integrating applications with HOLLIS, Harvard’s online library catalog. In Sibley’s books-only world, he struggled with dust, drafts, mold, paper-eating worms, window-breaking toughs from East Cambridge, and undergraduates careless with matches. Gore Hall library was then Harvard’s sole repository for books, the information technology of the day. Today, Harvard Library deals with a “continuum” of holdings, said Shenton — from medieval manuscripts to books to paper archives to film and to digital content that never saw print and never will. The reorganization is designed to cope with an increasingly digital future that “is here — now,” said Shenton.